Once again, we begin our (mis)adventures with a transit story. After a very toasty train ride from Prague, across Slovakia, to Budapest with broken air conditioning on a hot day, we arrived in the center of town and became very confused. Having read at the last minute that you can’t trust curbside taxis (they charge multiples of the legitimate fare), we debated what to do about this first-world problem. Do we pay the premium and suffer the annoyance of the rip-off? Do we call a cab and wait or immediately take the metro to our apartment? It’s become a self-inflicted point of pride for us now to figure out the public transit system as quickly as possible in every city we go to, only this time we made the mistake of deciding to do that with heavy suitcases in tow. And lots of stairs. And no signs in English. And complete confusion. I swear sometimes I think flesh-eating bacteria must be devouring our frontal lobes, because we somehow find ways to make things as hard as possible on ourselves. Like now. By now, it was dark, and as we stepped into the building of our Airbnb apartment, our jaws dropped. Apparently, it had not escaped World War II unscathed and had not been touched since. Holy cow. We sent the bags up the creepy, 1930s service elevator and then walked up the creepy, dimly-lit, winding stairs. With each of the four flights, we grew increasingly wary. Good gosh, what were in for? To our astonishment, we opened the apartment door, and voila! It was newly renovated and beautiful – even nicer and larger than the Airbnb pictures had indicated. We couldn’t believe the juxtaposition. Relief flooded our bodies. Later, we figured out that this was a really convenient part of town and that all we had to do was turn a blind eye to the building aesthetics. If Prague is a historical Disneyland, Budapest is Busch Gardens – not quite the same must-see reputation as a tourist draw but still full of character, great attractions and charms of its own. And in some ways preferable. We were only there for three-and-a-half days (Aug 15-18), but we packed a lot in without it being exhausting. Walking Tour with Comedic Guide: This is a great way to get an overview and see key sites while laughing enough to keep it interesting. The tour guides are all super fun and funny with great stories, so they really bring it to life. It’s free, so just show up and then tip generously at the end. Our guide, Andor, offered interesting tidbits and advice, including a few practical items: The Rubik’s Cube inventor was Hungarian. Houdini was born in Budapest. Hungarians put paprika on virtually everything. Its synagogue, the largest in Europe, seats 3,000. Eat only at restaurants where you have to ask for the English menu. (“Locals don’t eat where the English is posted outside and neither should you.”) While Hungarians are proud of their beer, buy the Czech beer, because it’s better. And go to a “ruin bar” at some point, which Budapest nightlife is famous for. These are just what the name says. Someone finds an abandoned building, sets up a bar and stocks it with alcohol, sprinkles in some old furniture and funky art, hires a DJ, and puts the word out. He gave out restaurant reco’s as well, though our best find, Menza, came through a chance encounter with a local. Recommended by a local and one of the tastiest meals we’ve had on the trip: Hungarian beef stew with homemade noodles at Menza. 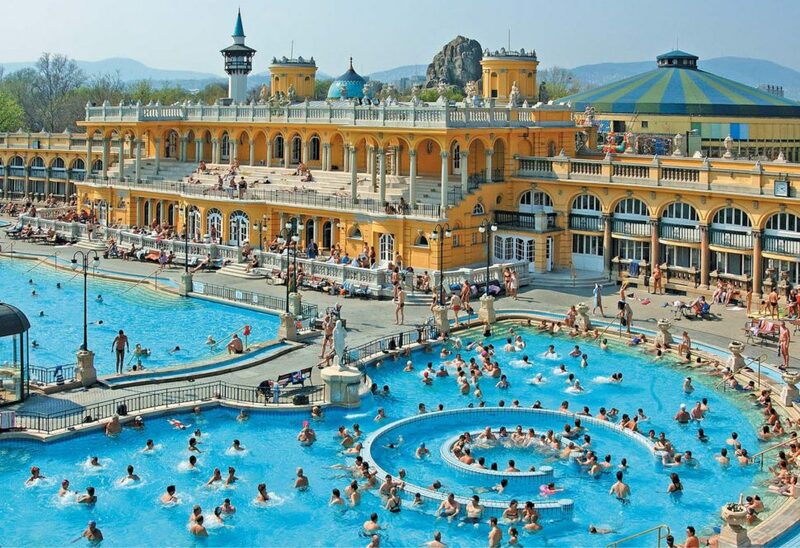 Thermal Baths: Sitting on a network of over 100 thermal springs, Budapest is famous for its baths, and the main, large facility, Széchenyi Baths in City Park, did not disappoint. It was gorgeous. But here is where the “lived to tell about it” comes in. For some ungodly reason, it never occurred to us that we wouldn’t be the only ones to have the brilliant idea to visit the baths during peak tourist season. In a heat wave. By the time we arrived in the mid-afternoon, the place was packed beyond capacity. The line that didn’t move. At least we had plenty of time to admire the architecture. So we got to wait. And wait. And wait. In the heat. Until finally. They let us in. And then we made our way into the various pools. The water was warm but still refreshing. Successfully ignoring the ick factor of being in such a crowded pool, we had a ball. For the kids, it was a major highlight. St. Stephen’s Basilica: Easily the most beautiful church we’ve seen to date. The interior is just spectacular. Segway Tour: This was a huge blast and highlight for all of us. Much more reasonably priced than in the US, we zipped all over the place, less interested in the sights and more interested in the thrill of the ride. Call our guy, Max, at +42-773-203-447. He and his team were phenomenal. If you can’t get in touch with him, look for anyone hanging out on a Segway in front of St. Stephen’s Basilica. You’ll get a short lesson and then be on your way. It’s a blast. Be sure to go to the Parliament building area where there is an open square you can drag race on, if you want. Hop On, Hop Off Bus: This was an easy way to get around while also seeing the city. Our ticket came with passes to the baths and a no-frills, one-hour river cruise, which was all we needed. Evening River Cruise: The city is spectacularly beautiful at night, and you get a marvelous overview from a different vantage point. You can do the simple one-hour ride or make an evening of it with cocktails and dinner. Each of us in the family rank Budapest differently among our mini-trips so far, but it’s definitely high on the list. The kids loved it, because of the Baths and the Segways, so mission accomplished. Glad you had a great time! Love all the photos and the descriptions.